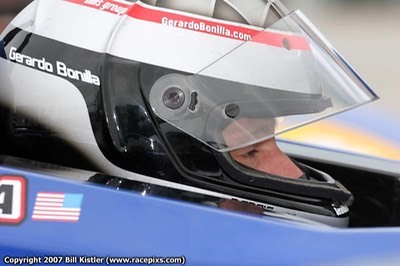 Our spunky race team at B-K Motorsports brought the BP Lola Mazda LMP2 car to two races to close out the month of August, first to Mosport near Toronto, Canada, followed a week later by the Raceway at Belle Isle in Detroit, Michigan. We endured a challenging week at Mosport. Some technical issues plagued us early on in the weekend, limiting our track time. 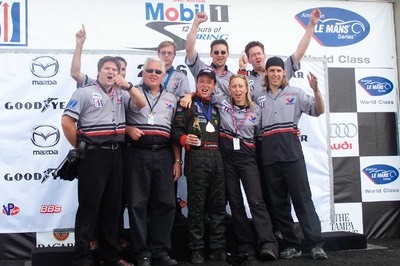 At the official race weekend Friday to Sunday August 22-24, despite spirited drives by Ben Devlin and myself, and considerable effort by the B-K crew, we struggled to perform as well as we did in 2007 (4th place). 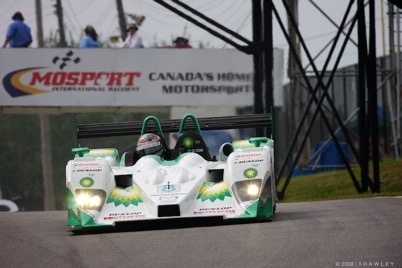 Even with our issues, driving at Mosport was a dream come true. 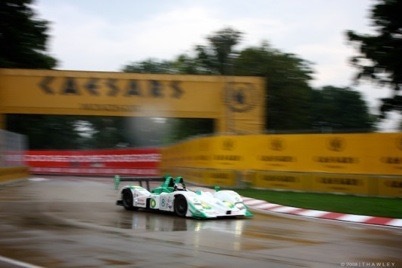 One of North America's classic high speed race tracks, going for a race in a LMP2 car was something I had always wanted to try. With mostly 5th and 6th gear corners, the speeds are simply in another league. Most tracks have one major corner that is really fast and thrilling. Mosport has five of them. There are effectively only eight turns in total. I was just grateful there were so many fans on the hills to watch, because what these cars can do is really special. 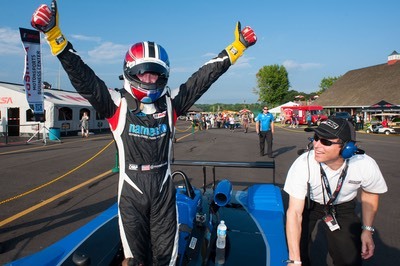 The following week we were at Detroit, together with the IRL IndyCar Series. I spent Wednesday on foot walking the track and writing notes. Thursday was spent in valuable discussion with team engineers and with my teammate Ben. Friday's practices were both affected by rain. My boss Robert Bach was kind enough to allow us to practice in the rain. There is certainly something special about learning a new street circuit track surrounded by concrete walls, in the rain, in a LMP2 car! A very special moment indeed! However, the rain meant we had no dry weather practice. Next up was qualifying, so Ben handled those chores thanks to his past year experience at the track. My only chance to learn the track would be Saturday morning's warmup session, in which I got seven laps to learn the track. Sometimes, I just love this sport. Where else would you be expected to perform with so little practice? In the race, our entire team rose to the challenge. Pit stops were flawless. We even beat a couple of legendary teams in the pit lane. Ben drove an awesome first stint. I glued my eyes to the television monitors to learn where he was passing, a critical learning experience for a street circuit's concrete canyons. When it was my turn, I experienced a memorable exchange on the radio during a full course caution period, waiting on the restart. ME - "Mike, that's Brabham ahead of us, correct?" MIKE (Engineer) - "Yes, Brabahm, and he's for position." ME - "And who is behind?" 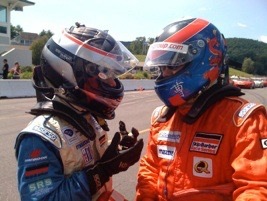 MIKE - "De Ferran and Briscoe"
ME - "All for position?" MIKE - "Yes, all for position, lets go racing!" ME - "Music to my ears, and all with seven laps of practice!" MIKE - "You don't need any practice, go get 'em"
ME - "Ah, yes, no pressure at all!" It's not everyday you are following a guy as good as David Brabham, and AHEAD of some guy named Gil de Ferran, or even Ryan Briscoe. I don't think it will ever stop being so special to be racing in this series with such great drivers and teams. My stint was an exciting one. 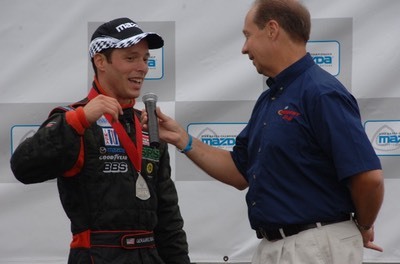 When I finally learned the track, I set into a battle with Chris Dyson, a battle he eventually won, but one in which I was in position to pass several times. When traffic would separate us, it was only a matter of a lap or two to close the gap again. We were quicker, and with more experience, we'll be by them much sooner. 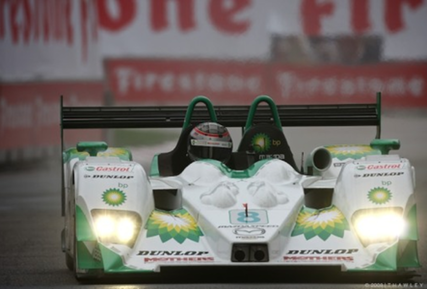 We ended up 7th in LMP2, and 7th overall (after the Audi was penalized). It's an exciting time for our Mazda team. A brand new Lola coupe has arrived and is ready to go for Road Atlanta. Anything is possible. Wish us luck!